Ireland’s Ashford Castle not only is the “Top Resort in Ireland” but “Top Resort in Europe” according to readers of Condé Nast Traveler in the magazine’s annual Readers’ Choice Awards. Runners-up were the Villa d’Este on Italy’s Lake Como and the Hotel du Cap-Eden Roc in Antibes on the French Riviera. Ashford Castle, which sits on 350 acres of County Mayo on the shores of both Lough Corrib and the River Cong, has a long history, dating back to 1228. A hotel since 1939 with 83 guestrooms and suites, the castle enjoys an exceptional backdrop of forest, lake, river and mountains. It offers a remarkable collection of “country sports” featuring horseback riding, fly fishing, golf on its exclusive nine-hole course and Ireland’s first school of falconry. The Condé Nast Traveler Readers’ Choice recognition comes on top of Ashford Castle’s 2010 Gold Medal from the Green Hospitality Awards and Trip Advisor’s 2010 top ten picks for European castle hotels. 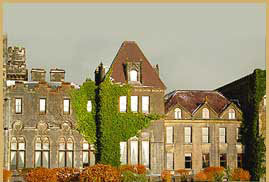 I stayed at this grand old castle many years back and it was an unforgettable experience. Ashford definitely is staying with the times, even offering “Hogwarts Family Midterm Break” packages. Next PostA 35-Day Caribbean Cruise? For Real? how are you!This was a really magnificentsuper theme!